Mobile White Teeth Whitening Reviews - Is It a Scam or Legit? For those looking to get rid of teeth stains, the Mobile White Advanced Teeth Whitening system could be your solution. It uses whitening gel and an LED mouthpiece to whiten your teeth via 20-min. sessions. 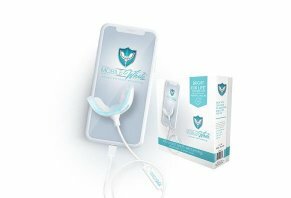 Mobile White Advanced Teeth Whitening is a teeth whitening system that uses teeth whitening gel and an LED-powered mouthpiece you can power via a smartphone or computer. The beauty of the Mobile White is that you can use it anywhere you have a phone or computer since the device uses USB power. The brand’s spokesperson is Dr. Bill Dorfman, a celebrity dentist who has made appearances on well-known national shows like Good Morning America, Oprah, The Tonight Show and Dr. Phil. In this review, we’ll examine how the Mobile White system works, discuss the science behind the type of gel it uses and then talk about how much it costs and what the fee is for getting additional teeth whitening gel. When your whitening kit arrives at your home, you’ll open your box to find the mouthpiece, four syringes that include 3 mL each of whitening gel, mobile adapters for the power cord and a storage case. When you’re ready to do your first treatment, you’ll use the syringe to evenly apply the gel in the mouthpiece. From there, you’ll plug the mouthpiece in, push the timer button on the cord and then put the mouthpiece on your teeth. You’ll want to keep the mouthpiece on our teeth for 20 minutes. Mobile White says the 16 LED lights in the device enhance the whitening process but aren’t harmful to your teeth or gums. You should get the results you want in six to eight treatment, the site claims. The gel that whitens your teeth has three non-toxic ingredients in it, the main one being carbamide peroxide gel. This is the ingredient that whitens your teeth, which is something we’ll talk about in the next section. While the Mobile White website says you should see results in six to eight treatments, the range of effectiveness starts at two to three days and goes up to a couple of months, the site says. Each individual, the site says, will experience different results. There are no restrictions regarding food or drink after you do a whitening session, although the product’s website says to avoid staining agents like coffee and tea. In our research of this product and other teeth whitening products, we’ve discovered that much of what will make a gel, paste or strip effective is the ingredient it uses to whiten teeth. According to Dr. Ron Baise, a London-based dentist whom we contacted for our review of Power Swabs teeth whiteners, the only two whitening agents that are actually effective are hydrogen peroxide or carbamide peroxide. This is good news if you’re interested in Mobile White because it uses carbamide peroxide. This isn’t a guarantee that the product will work though effectively, though. As we mentioned a few seconds ago, the results the whitening system provides will vary from person to person. Some may see a difference in a matter of two to three days while it may take months for others. Dr. Libbi Finnessy, a Seattle-area dentist, told us that anyone who uses whiteners needs to keep in mind that the whitening ingredients can irritate your gums, so take care to make sure you keep the gel on your teeth. » Related: Does Activated Charcoal Teeth Whitening Work? You’ll pay $9.99 shipping if you buy one or two devices. If you buy the three- or five-pack, you’ll get free shipping. The prices seemed a bit high so, as a test, we filled a child’s Tylenol syringe with 3 mL of water and weighed it using a precise scale. The filled syringe was around 9 grams. Assuming that the gel is heavier than water, we’ll estimate that one syringe weights 15 grams. If you bought a dozen gel syringes, they’d weigh around 180 grams, which is less than half a pound. In theory, a shipment of that weight, including some extra packaging, should cost you $6 or less. Throw in some branded packaging and cushion inside the box and we could see that price going up to around $10. In our opinion, the shipping charges for your syringes are unusually high, such that we believe that buying 12 syringes – or even two – isn’t quite “free”. As for returns, you have 30 days to try the product and return it if you don’t like it. The fine print notes that you may have to pay a 15% restocking fee if the box is opened and/or you’ve used the whitener. To start a return, you’ll need to contact Mobile White at orders@upintehlab.com. There are dozens – if not hundreds – of choices you have when it comes to teeth whitening. As we point out in our guide to choose an at-home teeth whitener, there are multiple methods, too. There are strips, swabs and, in the case of Mobile White, mouthpieces. The big difference between these four systems and Mobile White is that Bright Light uses a separate light and mouthpiece. California Bright, PHOBE and Novashine use a mouthpiece with LED lights built into it. Another difference we noticed is that Bright Light comes with three syringes of whitening gel, California Bright has two, Novashine has one and PHOBE doesn’t ship with any whitener. Each one uses carbamide peroxide and, by our estimation, each one looks similar to the Mobile White. We believe that, based on the evidence presented in this section, the Mobile White whitening system doesn’t offer quite the value that the other products do. All four competing products use USB cords to power the device. We see the most important difference (aside from price) being the gels you get. Each kit comes with a different number of gel syringes but that’s not as much of an issue as getting refills. Amazon offers a variety of vendors who provide packs of carbamide peroxide syringes. One of the better deals we found was $24.99 for 10, which is $3 more expensive than what Mobile White offers. So, while the Mobile White is more expensive up front – $79.99 vs. $18.99 - $59 – you could end up saving money if you do seven to twenty reorders of syringes. However, considering how the company claims you should see solid results after six to eight treatments, you may never order an additional seven to twenty syringe 12-packs. Because teeth whitening can have mixed results, we’d be hard-pressed to recommend Mobile White over the four systems from Amazon. The up-front cost is significantly higher than competing products. As you’re deciding about the right at-home teeth whitening kit, it’s important to understand that there are two ingredients that can, according to the experts, elicit a positive effect on your teeth. Mobile White uses one of them – carbamide dioxide. In this sense, we think the product starts with the right foundation. We also believe the use of a mouthpiece lowers the probability that you’ll get whitening on gel on your gums and the subsequent irritation that’s common when whiteners come in contact with gums. What concerns us about the product is the price, as we found LED-gel whitening kits on Amazon for at least $20 less. The other concern isn’t specific to Mobile White but is a general drawback to mouthpiece kits: size. Not every consumer has the same size mouth and the same shape of teeth. For additional information, head to our guide to at-home whiteners to learn about other options. We give you an in-depth examination of how whitening works and which types of products are available. Write a Review for Mobile White Teeth Whitening!